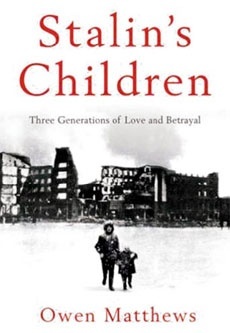 Owen Matthews’ book, Stalin’s Children, goes to the heart of the émigré experience in relation to Russia. It is subtitled Three Generations of Love, War and Survival, and each of those generations had a different experience of émigré life. Matthews’ mother emigrated to England, and he emigrated—though on a less permanent basis—to Russia. His grandparents in Russia became émigrés in their own land—at least those who were not killed by Stalin. The history of this family is artfully told by interweaving the stories of the three generations in a way which ultimately illustrates the old proverb that it is better to travel hopefully than to arrive. There is a subtext, which is that, having arrived, it is essential not to look back, lest the road once travelled begins to seem more attractive than the unavoidable present. The most successful mover in this story is Matthews’ mother, Lyudmilla, who gave hardly a thought to Russia after she had left it. Her husband, Mervyn, by contrast, hovered between looking forward to Russia, back from it, and then casting his gaze all over the world when life eventually forced him to settle in England. Mervyn is the least contented of all the characters in this story. Somewhere between him and Lyudmilla is Matthews himself, who is currently Moscow bureau chief for Newsweek. He is married to a Russian woman, with whom he has two children. But, perhaps sniffing the wind (though this is not explained), his family now lives in Istanbul. Beyond the text and subtext in this complex and interesting book is a lightly-drawn moral: that love is not necessarily always all that it is cracked up to be, or at least there needs to be more than young love continued for a relationship to last a lifetime. A couple needs to have something practical in common, and that is not easy when they come from cultures as different as Britain and Russia. After studying Russian at Manchester University, he was awarded a Fellowship at Oxford, and shortly afterwards found himself in Moscow at the Festival of Students and Youth, which was “an intoxicating immersion in the world he had studied so long. Mervyn was so excited he hardly slept.” Soon after that, he landed a job at the British Embassy here, then moved to Moscow State University. Finally he found himself being entertained in expensive dachas and taken on trips to Siberia, all of which turned out to have been funded by the KGB, who were hoping to recruit a new agent. Then he met Lyudmilla. But their plans to marry were shattered when Mervyn was expelled from Russia after refusing to work for the KGB. A long, intense courtship ensued. Mervyn was a lonely academic, and he lobbied hard to get her released from the Soviet Union. But to no avail. But she was a strong-willed, single-minded woman who was able to stand the five years of separation and uncertainty without faltering in her determination to marry her sweetheart. Perhaps this was due to the staggering hardships of her childhood, in an originally privileged Communist family which fell foul of the great purge machine in 1939, then got in the way of the Nazi war machine two years later. She ended up in a Soviet orphanage, emaciated and ill, but undaunted. The most unusual aspect of this story— given that star-crossed lovers are not uncommon—is what happened when this dynamic woman arrived in London, to live with a Sovietologist who was persona non grata in the Soviet Union, and who had also managed to irritate the powers-that-be at Oxford sufficiently to get himself expelled. Worse, he had largely lost interest in Russia. Matthews gives sympathetic consideration to the problem of a person who, at a young age, forms an attachment which ultimately disappoints him. Mervyn is not the only person I have heard about who fell under the weirdly exotic spell of the Soviet Union, invested his whole intellectual life in mastering the Russian language and Soviet politics, only to discover twenty years on that it was a Potemkin exoticism that lay at the end of his personal rainbow. This is not a question of what happened after 1991, it is to do with the truism that, just as beauty is in the eye of the beholder, so exoticism is in the mind of the observer. Mervyn was one of those who thought the old “Moscow kitchens”, with their vodka, cucumbers, tea, philosophy, thick journals and that sense of cosy, besieged hugger-muggerdom which Western dining tables could never match, was something intrinsic to Russia. Now that “freedom” has arrived, we see Russian life is, and in many ways always was, much the same sort of “sobaka- eat-sobaka” world of biznismenni and operators that we have in the West. In the end, if you subtract the violence (which was never part of the ideal anyway), communism amounted to little more than capitalism without consumerism.